ST. ALBANS, Mo. – In refreshingly mild July conditions, Dawson Ovard, 15, of Frisco, Texas, shot a scintillating 8-under par 64 in the 42nd Boys Junior PGA Championship at The Country Club of St. Albans, setting the record for the lowest-ever First Round in Championship history. Ovard, a protégé of 2015 PGA Teacher of the Year Cameron McCormick—who also coaches 2017 Open Champion Jordan Spieth— broke a record that was held by a group of six players, including PGA Tour star Justin Thomas (2010). The most recent 65 in the Championship’s opening round was by J.B. Williams of Danville, Kentucky, in 2012. Starting on the back nine of the Lewis and Clark Course, Ovard’s eagle on his second hole (par-5, 493-yard No. 11) kick-started his historic round. He would later add a 10-yard chip-in birdie on his 5th hole (No. 14); a dramatic 40-foot par putt on his ninth hole (No. 18); and three straight birdies on his 14th, 15th and 16th holes played (Hole Nos. 5, 6, 7). All told, the Class of 2019 SMU commit and current Frisco High School student, recorded one eagle and six birdies in his bogey-free round. For Ovard, it was the lowest round in relation to par he has ever shot (he once had a 63 on a Par 70 course). Ovard delivered a 32 on the front nine and matched it with another 32 on the back nine. Just one shot back in second place is Jacob Bridgeman, 17, who sank five birdies on his first seven holes, en route to a 7-under-par 65. Bridgeman, the two-time South Carolina High School State Champion, carded his only bogey of the day on his eighth hole played (par 4 , 485-yard No. 17). He would more than make up for it with birdies on three of his final nine holes (Nos. 2, 5, 8). Bridgeman would come within a whisper of a 64, as well, when his 10-foot putt on his final hole (No. 9) just missed to the right. Two shots back in third place is Reid Davenport, 17, of Austin, Texas, who carded eight birdies versus two bogeys on his round of 66. Davenport made five birdies on the first six holes, as he shot a 32 on the front nine. “I need to start tomorrow, act like everyone’s even, and start like I did today,” said Davenport, a Vanderbilt commit. Bryce Lewis, of Hendersonville, Tennessee ,began his round with three consecutive birdies on Nos. 10, 11 and 12, while playing the back nine. He made the turn at 5-under-par 67 with a scintillating 31, playing one-stroke better than Ovard at the clubhouse turn. He accentuated his round with a 45-foot birdie putt on his eighth hole (No. 17). “If the weather stays the same, I will have to keep shooting like this to win or stay high,” said Lewis. “The course is in great shape and it’s scorable, if you hit it in the right place.” Lewis is tied for fourth with University of Georgia commit Trent Phillips, of Inman, S.C. , and Daulet Tuleubayev, of Cupertino, California. Four shots back in a tie for seventh is a group led by the USA Today All-Boys Golfer of the Year Eugene Hong with a solid 4-under-par 68. The Florida Commit and 2016 U.S. Junior Ryder Cup Team Member found the right stroke off the tee and a little luck on the green. He rolled in a 40-foot, right-to-left birdie putt on the par 3, 216-yard 7th hole, with a bit of drama, as the ball circled the cup before dropping in for glory. Hong is one of three players who made a hole-in-one in yesterday’s practice round. He is tied with another Gators commit (Class of 2019), Clay Merchent, 16, of Woblesville, Indiana, whose father, Mike Merchant is a PGA Member. Merchent, had a colorful round, highlighted by a 30-foot eagle putt made on the par 5, 493-yard 11th hole, along with five birdies and two bogeys. Luke Kluver, of Norfolk, Nebraska, joins Hong and Merchent at 4-under-par. A group of nine players are packed together in 10th place at 3-under-par 69. Last year’s runner-up Patrick Welch, of Providence, Rhode Island, is tied for 45th place, after recording a 1-over-par 73. The 2016 Boys Junior PGA Champion Norman Xiong, of Canyon Lake, California, now plays for the University of Oregon. Xiong received the national 2017 Division I Phil Mickelson Outstanding Freshman Award and was part of the Ducks team that finished second in the NCAA Championship. He also was a key member of the victorious 2016 U.S. Junior Ryder Cup Team. The Championship’s second round will be played on Tuesday. For pairings and tee times, please click here. 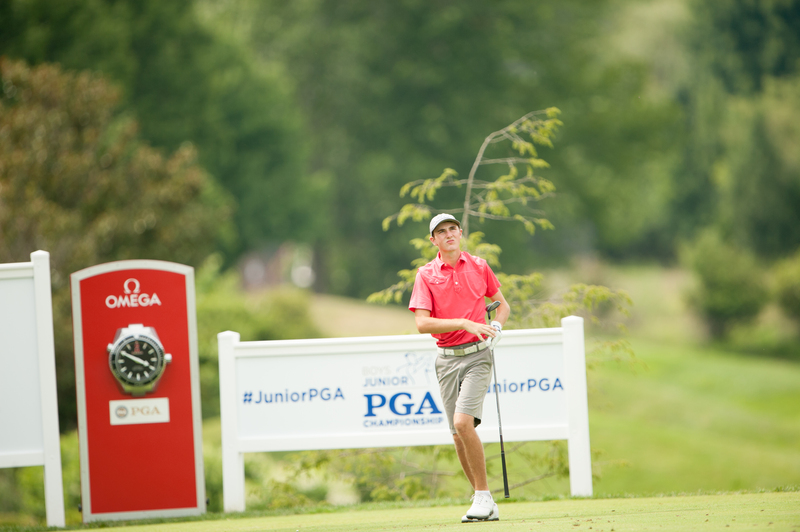 For more information, please visit JuniorPGAChampionship.com.